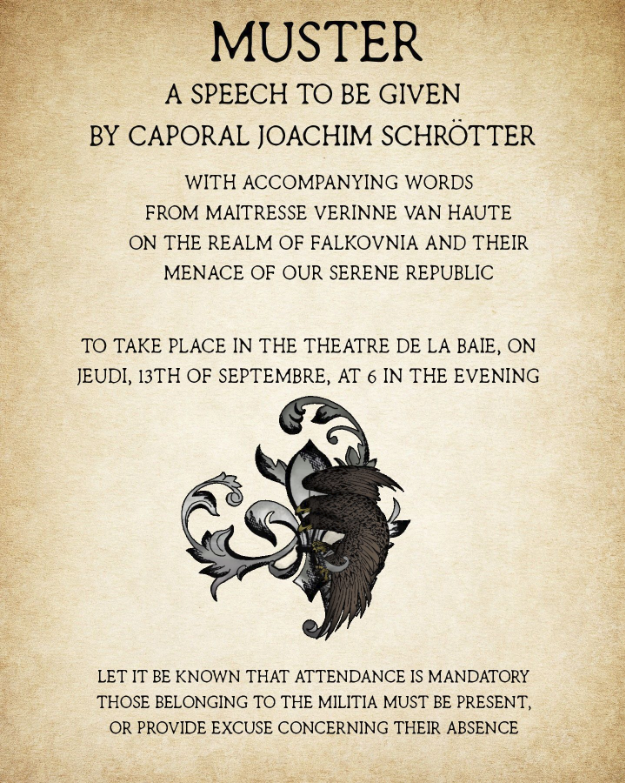 "One's own thoughts are his only prison"
// If you are a Milice and unable to attend, just send a forum PM to BraveSirRobin with a suitable IC excuse. // Bump this is in four hours! Citizens. Fathers. Daughters. Mothers. Sons. I bring you here before me, within the Capital of our Serene République to confirm to you, the news I believe none of us truly wished to hear again. That in the most dire hour of our nation's health, as Fair Dementlieu's wounds mend once more from the tumultuous civil war that has wracked her to her bones, the Falkovnian Regime is once more, marching West. You may look upon me with trepidation. The sign of birth upon my forehead, yet the uniform of this République's most noble defenders upon my shoulders. I say to you, Citizen, there is no-other more capable of speaking of the atrocities of the Falkovnian Regime than he who was wrought and born in it, bearing witness to the most cruel and unusual defilement of even those ... The KingFürher would call his subjects. I have fled the Falkovnian Menace, to the West, I have witnessed the cruelty that Dementlieu suffered, but two years ago, upon the lands I might have in my memory, as a child. I say to you, Citizen! I will bleed upon these cobblestones to ensure that you must never suffer the atrocities I have seen, but men such as I cannot, alone, stop the Zweifalk from pressuring further into Dementlieu's heartlands. Even now as we speak, the Maîtriser, Marius de Mortigny, Duc d'Ameranthe, rides East with his army to ensure that Seimarie and Castle Ameranthe do not falter from their ancient posts as wardens of the Eastern border. Their blood, blue and red alike shall mingle in rivers, lakes and fjords to the likes of which we cannot possibly imagine. Lands, such as Sévigny have suffered and struggled to recover in the years since the last incursion of the Hawk. We cannot, and shall not let them take pleasure in yet a second hunt. Your home, my adopted Country, has bled itself heavily in a civil war that has weakened her, to the pleasure of the KingFürher. He sees that now is the time to strike, and yes, he will! The Duc d'Ameranthe even now, in this time of uncertainty, when we have turned our eyes from war, to peace - has answered the call of OUR citizens to fulfill his Noblesse Oblige and ensure the safety of our arts, culture, our way of life as we know it. Yet, he cannot do this alone. A call has been issued, for men and women, unmarried and between the ages of eighteen to twenty-five to enlist with the Milice Nationale, to safeguard our way of life. A call has been issued, for men and women, beyond this category, of the nations of Borca, Richemulot and Mordent, whom of which we have stood stalwart beside for decades yet, to enlist with the Milice Nationale, to safeguard their way of life. For that if Dementlieu should fall, the KingFürher's dreams of conquest of the Western Core will not stop here. A call has been issued! .. To Dementlieuse Citizens, who are beyond these brackets, but yet still feel the burning embers of Liberty and Justice within their hearts, to stand in line with their young sons and daughters, to ensure that nevermore shall younger generations of Dementlieuse live in the shadows of conquest! Your COUNTRY has issued a call, Citizens!